ZONA B NO TAKE permitted diving only to authorized centers. The AMP was established with the Ministerial Decree of December 27, 2007 and its own regulation make it effective from June 5, 2008. 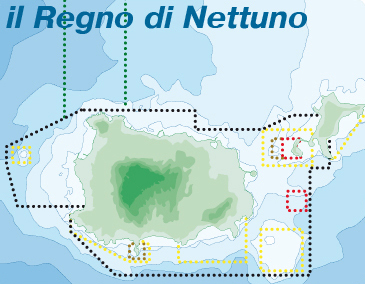 The “Neptune’s Kingdom” puts under protection areas that surround the Flegree islands of Ischia and Procida. Since last year is the area is active the operational supervision of AMP and the results have been immediately visible: barracudas, breams, snappers, greater amberjacks have accompanied us in our dives, making them even more exciting. Conservation areas are four: zone A, zone of integral reserve, which is inaccessible and represents the area intended for restocking; is the most important among protected areas, allowing residents species to grow undisturbed and generally becomes a temporary refuge for many species. The B and C zones are intended as partial reserve zones, where some activities are not allowed: these areas are typically referred to as buffer zones, since their concentric arrangement around the A zone allows a gradual lessen for impact of human activities on it. B no take zones are only accessible to authorized diving centers like ISCHIA DIVING. Those areas are:The cliffs of Sant’Angelo, one of the most spectacular cliffs around the Flegree Islands, thanks to the greater development of the coral-like habitat, with large gorgonacei facies, that besides Eunicella singularis or white gorgonian and E. cavolinii or yellow gorgonian, also includes deeper Paramuricea clavata and Corallium rubrum, and even some specimen of Savalia savaglia (false black coral), quite rare to find in the Flegree Islands area. Secca delle formiche: rather superficial platoo in Ischia channel, west of the isle of Vivara, is a slightly curved bedrock within 6 m and 20 m depth. The whole bench is surrounded by an extensive grassland of Posidonia oceanica and is characterized by the presence of several variable-size submersible cavities and small canyons. Walls colonized by Astroides calycularis, Parazoanthus axinellae and Eunicella cavolinii backdrop to an abundant and varied pelagic and resident fish fauna. The D Zone encompasses the Mediterranean area which has the highest concentration of marine mammals, with the simultaneous presence of all species living in this sea. It was therefore necessary to regulate navigation speed in order to avoid frequent injuries to these species.